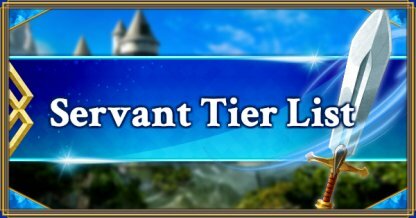 Welcome to our Servant tier list for FGO (Fate/Grand Order)! This list has been compiled and approved by major fanatics of the game. Please refer to this guide if you want to check out our performance assessments and evaluations of Servants in FGO. Servants that are able to effectively take out enemies regardless of the Daily Quest. Levelling up should be your highest priority, so that means farming Experience Cards. These Servants are useful not only for Experience Cards, but farming other items too. Regardless of any compensations for their Class, these Servants have enough firepower to farm Experience Cards, or have excellent reinforcing effects. A certain Skill Level maybe required, but generally in terms of performance, there’s no harm in levelling up these units. Not the best tier list but appreciate the ****ysis.